When was the last time you bought a new mattress? If it’s been more than five years, there’s a good chance it’s already time for a new one. Which mattress should you choose to erase body aches, keep you healthy, and ensure all the health benefits from a full night’s sleep? We’re so glad you asked! We’ve fallen in love with Saatva Mattress, the mattress company that’s been around since 2011 and is the first mattress company to sell only online. 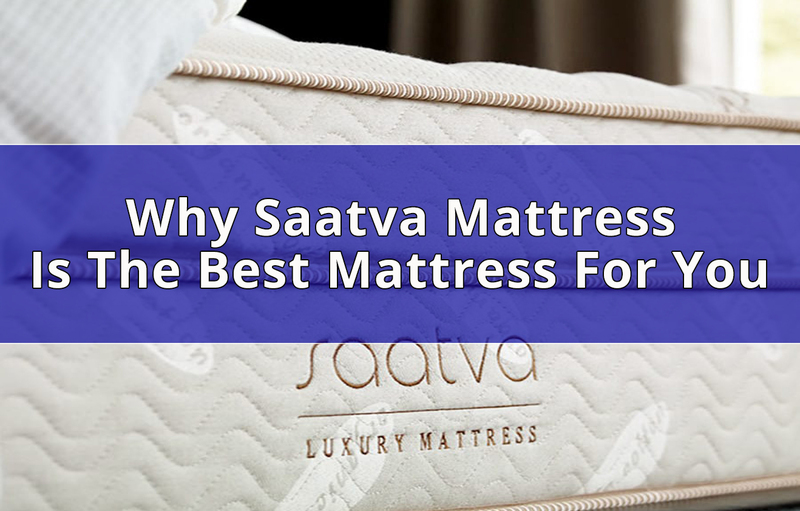 Today, Saatva Mattress is known for its affordably luxurious coil mattresses, as well as its eco-friendly foam mattresses found under its Loom and Leaf brand, and its natural latex mattresses sold under its Zenhaven brand. All three brands have a reputation for high-quality, without the price. The Warranty Is How Long? While traditional mattress retailers are known for being gimmicky (if not downright sleazy) with their marketing tactics and pushy salespeople, Saatva has stood out--in a good way--since the beginning. Created by two seasoned pros in 2010, the company eschewed brick and mortar stores in favor of selling online only. We like to think of Casper as beginning the online mattress industry, but it’s more accurate to say Casper pioneered the bed-in-a-box foam mattress; it was Saatva who first had a hunch that what people wanted was an easy mattress shopping experience. Ultimately, Saatva’s online-only business model allowed them to skip the middlemen and keep expenses low, passing on a fat discount to consumers. The company’s name is a version of the Sanskrit word for pure (sattva). It has been featured by Inc, Vogue, Forbes, and many others and now hits sales in the hundreds of millions each year. Once your order is placed, a Saatva customer service agent will help you navigate the delivery process, since your purchase includes installation as well as mattress removal (optional). The flagship Saatva mattress is designed, in Saatva’s words, to combine “American craftsmanship” with “environmentally responsible materials.” This isn’t the greenest brand you’ll find, but it is one of the most comfortable, and you’re getting it for a tremendous value. Coil on coil construction that utilizes two layers of tempered steel support. The base layer is shaped like an hourglass and offers tremendous support and durability, while the second layer is made from individually wrapped steel coils. Pocketed coils are the premier manufacturing type for coil beds and significantly minimize motion transfer while allowing for a contoured, comfortable night’s sleep. Dual Perimeter Edge Support System, which means additional foam for anti-sage edge support. This both increases the bed’s overall durability, and allows you to take advantage of every inch of your mattress--extra helpful if you’ve got kids or dogs that like to share your bed! A layer of high-quality memory foam, which provides lumbar support and pressure point relief throughout the night. An advanced euro pillow top, normally only found on $2,000+ mattresses. Saatva explains that the features mentioned above would normally retail for over $2,700, but its queen is available for just $999, making it comparable with memory foam bed-in-a-box mattresses--but much, much nicer and more durable. In fact, Saatva expects each bed to last up to 15 years. Each Saatva mattress works on a standard base or the company’s adjustable base, which can be purchased with either the 11” option or the 14” option. Finally--and probably most importantly--Saatva Mattress performs incredibly well in reviews. On Google reviews, a third-party review site unaffiliated with Saatva, the company rates a whopping 4.8 stars out of 5. That’s a 94% approval rating for over 2,400 reviews! We’ve seen few companies come close to this high of a rating. There aren’t a lot of people who won’t benefit from a Saatva mattress. And at less than $1,000 for some serious luxury, it’s hard to come up with reasons to not replace your old mattress! SLEEPS COOL- The Designed to sleep cool with a non-toxic, proprietary cooling gel layer. We almost hesitate to use the word luxury here, because we don’t want you to think this mattress is expensive--because it isn’t. Just like the Saatva mattress, which has combined made-in-the-USA, luxurious quality with a value pricing, so Loom and Leaf have been able to turn premium 5lb. memory foam into a beautiful mattress buying experience that won’t cost you an arm and a leg. 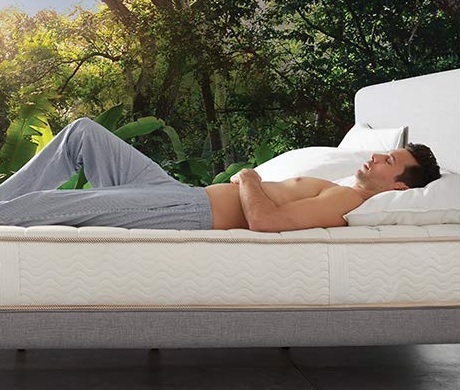 Unlike many other bed-in-a-box foam beds, this one utilizes cooling gel, breathable channels, organic cotton covers, and premium foam made in the United States. It all shows in the reviews. Again, when we take a look at Google’s Loom and Leaf ratings, we find that the company hits an average of 4.8 stars over 1,297 reviews. 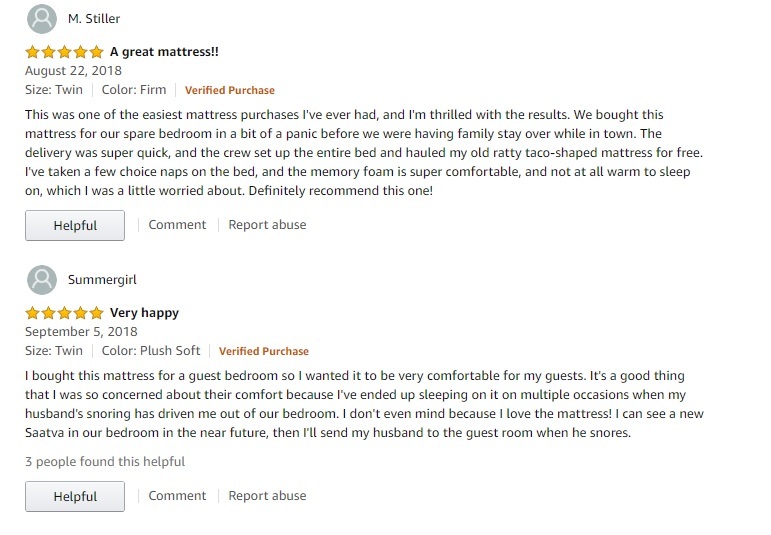 People write in to explain how they’re no longer waking up in pain, and how this mattress has proven to be better than much more expensive purchases. How does Loom and Leaf compare to the competition? It’s telling that the company has created a product almost identical to Tempur-Pedic’s Tempur Cloud Luxe Breeze, which retails for $4,700--nearly five times the price of the Loom and Leaf. Plus, Loom and Leaf offers a 120-day trial (Tempur-Pedic offers a 90-day trial) and a 15-year warranty (versus Tempur-Pedic’s 10-year warranty). Casper is the creator of one of the bestselling memory foam mattresses available online today, and it’s worth noting the Casper mattress costs about $100 less than the Loom and Leaf. However, while Loom’s mattresses are 12” thick and utilize five layers (plus a cooling layer of gel foam and another layer of contoured foam for extra breathability), Casper’s mattress is 9.5” thick and utilizes four layers of foam. Finally, Casper mattresses come vacuum-sealed in a box about the size of a golf bag, while Loom and Leaf hand-delivers and installs your new mattress, and removes your old. There are cheaper foam mattresses than the Loom and Leaf (or the Casper, for that matter), but if you can get what is essentially a Tempur-Pedic for a fifth of the price, why wouldn’t you? 100% TALALAY LATEX- Talalay latex offers a more natural, breathable, supportive, and pressure-free sleep experience. Saatva Mattress considers green to be the next big horizon, and it’s committed to this felt customer need by creating a line of natural latex mattresses known as Zenhaven. Latex, a sustainably-harvested, natural product is prized for its hypoallergenic, all-natural properties. 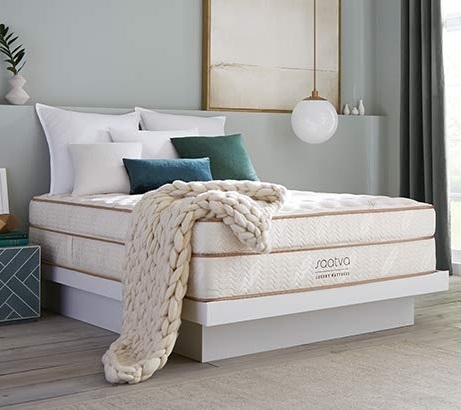 While the Zenhaven isn’t made from Dunlop latex, which is the most organic of the two types of latex available, it is made with American Talalay latex and organic New Zealand wool, prized for its cooling properties and natural fire resistance. Latex mattresses feel a bit like memory foam, but instead of sinking down into a hot mattress that will contour to you--but keep you from moving easily--latex allows you to move around more comfortably and a lot cooler. Normally, latex is very expensive, but in typically Saatva innovation, the Zenhaven is about half the price of a retail latex mattress of comparable quality. If you suffer from allergies, latex is an especially appealing choice, as it is resistant to dust mites and mold, which can exacerbate breathing problems such as asthma. The Zenhaven’s latex layers are formed with pinholes, tiny holes that allow air to penetrate, so you stay cool at night. The company has designed these pinholes around five distinct density zones to provide pressure relief where it’s needed--under the torso and shoulders, for example. Just like with Saatva’s other mattresses, your Zenhaven comes with free white glove delivery (which is ideal, because latex mattresses are heavy! ), a 120-night warranty, two firmness levels, and a whopping 20-year warranty (did we mention latex is extremely durable?). If you’re ready to pay a bit more upfront, a latex mattress is a great buy. A Zenhaven latex mattress is an even better buy.